Readings: Isaiah 60: 1-6; Psalm 72: 1-7, 10-14; Ephesians 3: 1-12; Matthew 2: 1-12. There is a link to the readings HERE. Increasingly, it seems, many people think the 12 Days of Christmas are the 12 days before rather than the 12 days after Christmas. But, in fact, Christmas does not end even at the Feast of Epiphany, but continues as a season in the Church until Candlemas or the Feast of the Presentation on 2 February. ● the Wedding Feast in Cana, which we read about on the Sunday after [20 January 2019]. This Sunday’s Gospel reading (Matthew 2: 1-12) is one that symbolises the gentiles coming to Christ, and bowing before him in worship, laying their gifts and treasurers at his feet. The promise of Isaiah after the return to Jerusalem is that the ‘nations shall come to your light, and kings to the brightness of your dawn … the wealth of the nations shall come to you. A multitude of camels shall cover you’ (Isaiah 60: 3, 5-6). The images in the Psalm of the kings across the known universe coming to visit the king in Jerusalem after the return from exile in the Persia empire also inspired Saint Matthew’s account of the visit of the magi. Saint Paul reminds us in the Epistle reading of the promises in Christ being brought as gifts to the Gentiles and in the Gospel we are reminded of the Gentiles bringing their gifts to Christ and worshipping him with all they have. This posting includes notes on each of the Lectionary readings next Sunday, and includes three sets of sermon ideas: the Gospel reading; a poem by TS Eliot; and a well-known Epiphany carol. This posting concludes with a note on Chalking the Doors, an Epiphany tradition that is found throughout the English-speaking world and that I notice in recent years is being introduced in places in Ireland. There are notes on how to mark the doors of a church and rectory/house, and some suggested prayers too. Darius, the King of Persia, has allowed the once-exiled people to return to Jerusalem. The prophet tells the people to arise, for their light has come and joy and prosperity are in the city. God is with them ans they will reflect the presence and glory of God. Dawn breaks suddenly in the Middle East, so that dark becomes day almost instantly. Thick darkness covers the earth and all people, but Israel will be different: God will come to them, be present with them and act for them. Many nations will come to pay homage to God. Only some of the exiles returned from Babylon, but soon those who were scattered at the conquest of Jerusalem will be gathered in together again and form a new community. People from all nations will come to the city to see God’s activity among his people. Those who return will grow in their knowledge of God and other nations will bring them their wealth in abundance. The wealth of these nations will be brought to them on camels and ships, across the seas and the sands, from Midian and Ephah, from Sheba and Tarshish. These gifts include gold and frankincense (verse 6), and Jerusalem, once destroyed by foreigners, will be rebuilt by foreigners. Psalm 72 is a prayer for eternal life, for God’s blessings for ever. It is a song praying for gifts for ‘the king,’ including justice, righteousness and long life, so that he may defend the poor, deliver the needy and crush the oppressor and that righteousness may flourish and peace abound. The psalmist mentions the kings of three areas: Tarshish, thought to be present-day Spain; the Isles, which may refer Crete and Cyprus; and Sheba and Saba, present-day Yemen, with its capital at Saba. The bring together the trade routes across the breadth of the whole Mediterranean, and from Jerusalem to the tip of the Arabian Peninsula at the entrance to the Indian Ocean and the African coast. In this way, they symbolise poetically all earthly rulers. The psalm contains memories of the Queen of Sheba visiting Solomon and the Temple in Jerusalem. The psalmist prays that these three kings may bring gifts to the one true king, who delivers the needy, hears the cry of the poor, has pity on the week and needy, and save the needy, delivers them from oppression and violence, redeems their lives, and saves them from bloodshed. Saint Paul speaks of himself as being called as the apostle who is sent to bring the gift of this good news to the Gentiles (verse 8) so that ‘everyone’ may know that they are invited to ‘see what is the plan of the mystery hidden for ages in God who created all things’ (verse 9). In this reading, Saint Paul says he is writing this letter from prison (see Ephesians 3: 1), probably in Rome. Although the Bible says it was written ‘to the saints who are in Ephesus’ (Ephesians 1: 1, NRSVA), some early manuscripts lack ‘in Ephesus.’ Perhaps this is a circular letter sent to a number of churches, celebrating the life of the Church. The word mysterion (μυστήριον) is used to refer to something hidden, a secret or religious mystery, not known to uninitiated, ordinary people. The Church came to use this word mysterion (μυστήριον) to refer to a sacrament, particularly to the Eucharist. In many Churches next Sunday morning, when we celebrate the Eucharist, we will be inviting people to approach Christ, in an Epiphany celebration, to lay our gifts before him, and to meet him in this sacred mystery. Saint Paul reminds us in this epistle reading that the coming of Christ is the fulfilment of the promises to the prophets and apostles (verse 5) and to all nations or Gentiles (verse 6), so that all may share in the promise in Christ. We have all become heirs to God together and members of one body (verse 6). 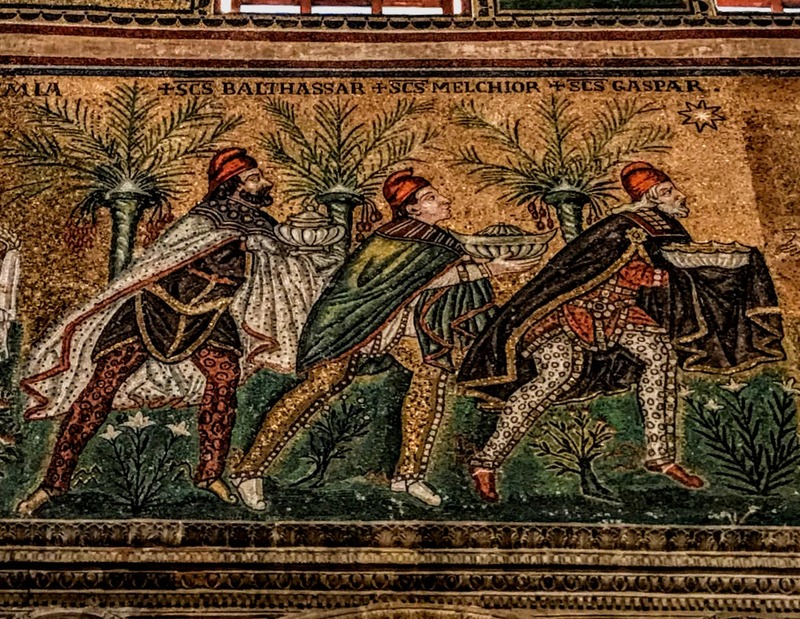 The Magi, as the ‘Three Kings’ or ‘Three Wise Men,’ are regular figures in traditional nativity stories and in Christmas and Epiphany celebrations. But the visit of the Magi is recalled in one Gospel alone, in Matthew 2:1-12, the reading for next Sunday. Although Saint Matthew does not mention the number of wise men, the number of gifts they gave to the Christ Child has given rise to the popular tradition that there were three Magi. The Hebrew Scriptures (see Isaiah 60: 1-10, Psalm 72) speak of gifts given by kings and of the Messiah being worshipped by kings. Saint Matthew’s account was reinterpreted in the light of these prophecies, and so the magi became kings rather than Persian wise men or priests. Perhaps this interpretation was influenced by the negative image of magi not in the Old Testament but in the New Testament. The word magi comes from the plural of the Greek magos (μαγος, plural μαγοι), which in turn comes from the Old Persian magus. These magi were members of the Persian priestly or religious caste. In the Hebrew Scriptures, for example, the magi or wise men are led by Daniel (see Daniel 2: 48). But the same term later has negative connotation when it is used in the Acts of the Apostles to describe the sorcery of Simon Magus (Acts 8: 9-13) and the magic of Elymas (Acts 13: 6-11). In Western tradition, the magi of the Epiphany have been named as Caspar, Melchior and Balthasar. These names may come from an early sixth century Greek manuscript in Alexandria, although other authorities say the names are first found in an eighth century Irish manuscript. However, Syrian Orthodox tradition names the three magi as Larvanad, Gushnasaph and Hormisdad, while Ethiopian sources name them as Hor, Karsudan, and Basanater, and the Armenians call them Kagpha, Badadakharida and Badadilma. In our cribs, they are often portrayed as European, African and Asian, with the European giving gold and the other two giving myrrh and frankincense. There are many theories about the meaning and symbolism of these gifts. 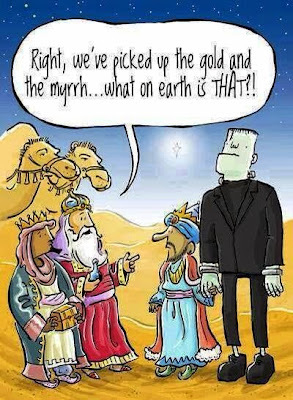 Gold is fairly obviously explained, but frankincense and myrrh are more obscure. Myrrh was commonly used for anointing, frankincense was a perfume, and gold is valuable. But the gifts had a spiritual meaning too: gold symbolises kingship on earth, frankincense is a symbol of priesthood, while myrrh is an embalming oil that symbolises death. Or gold represents virtue, frankincense represents prayer, and myrrh represents suffering. In the Patristic tradition, Saint John Chrysostom of Constantinople suggests that these gifts were appropriate not just for a king but for God. He contrasted them with the traditional Temple offerings of sheep and calves, and deduced that the Magi worshiped the new-born Christ Child as God. One story says the gold was stolen by the two thieves who were later crucified alongside Christ. Another says it was entrusted to Judas and then misappropriated by him. But in the Monastery of Saint Paul (Αγίου Παύλου) on Mount Athos, there is a 15th century golden case that is said to contain the Gift of the Magi. Saint Matthew sets the date for the birth of Christ in the reign of Herod the Great, King of Judah, who died in 4 BC. Herod’s fears are aroused because his dynasty may come to an end. He consults the religious experts to find out where the magi should look for the Messiah. They answer with Scripture: they loosely blend Micah 5: 2 and II Samuel 5: 2. The Twelfth Day of Christmas is the day, traditionally, that the Christmas decorations come down. But over the next few weeks, the Epiphany readings in the Lectionary remind us that the Christmas story is not just about the Crib and the Christmas or Nativity stories, but about God coming to dwell among us, and pointing from the beginning towards the promise and revelation to all nations, to all people. ● The miracle at the wedding in Cana (Epiphany II, 20 January 2019, John 2: 1-11). 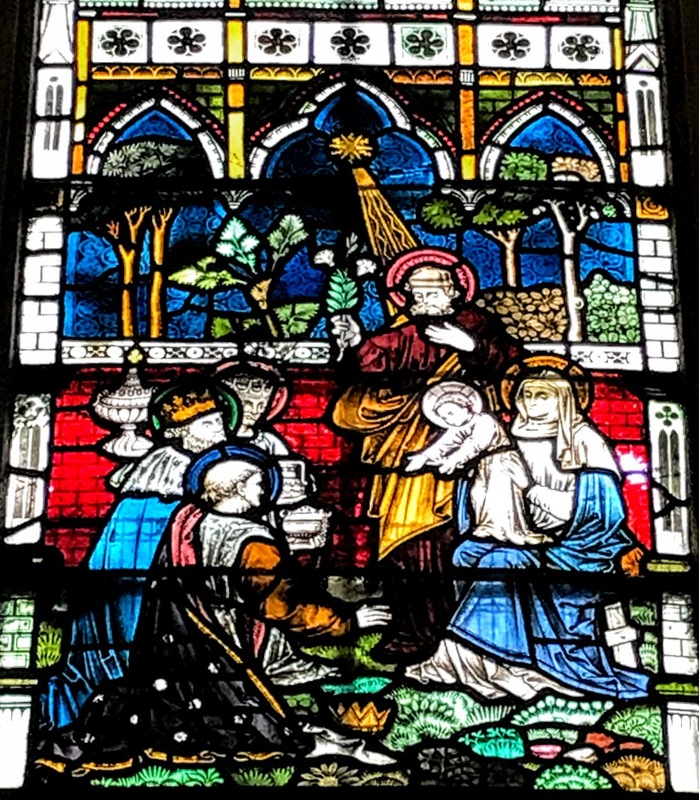 But, while we are moving from Christmas to Epiphany, which ends at the Feast of the Presentation on Candlemas on 2 February, the Epiphany season is truly a continuation of the Christmas season, the liturgical colour remains white, and together Christmas and Epiphany form one full, continuous season of 40 days. The visit of the Magi is a symbolic presentation of God’s revelation in Christ to the Gentiles. 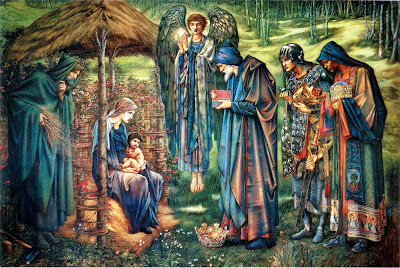 This Visit is a popular image for Christmas cards, but very often we have taken down the Christmas cards by the Feast of the Epiphany, and so we are left without a visual reminder of what they represent. Saint Matthew’s phrase ‘from the east’ (ἀπὸ ἀνατολῶν, apo anatolon, Matthew 2: 1), more literally means ‘from the rising [of the sun],’ but it does not tell us who they were or where they came from. ● Balthazar, an Arabian scholar. ● Caspar is the older man with a long white beard, who is first in line to kneel before the Christ Child and who gives him the gift of gold. ● Melchior is portrayed as a middle-aged man, giving frankincense. ● Balthazar is presented a young man, very often black-skinned, with the gift of myrrh. Saint Matthew names their gifts as: gold, frankincense, and myrrh: χρυσον (chryson), λιβανον (libanon) and σμυρναν (smyrnan) (Matthew 2: 11). ● Myrrh as an anointing oil for his priesthood, or as an embalming oil and a symbol of his death. Origen summarises it in this way: ‘Gold, as to a king; myrrh, as to one who was mortal; and incense, as to a God’ (Contra Celsum). King, and God and Sacrifice. Do you think the Virgin Mary and Saint Joseph took those gifts with them as they fled into exile in Egypt? Several traditions have developed about what happened to these gifts. There is a tradition that suggests Joseph and Mary used the gold to finance their when they fled. Another story says the gold was stolen by the two thieves who are later crucified alongside Christ. Yet, another says the gold was entrusted to Judas, who misappropriated it. And another story says the myrrh was used to anoint Christ’s body after his crucifixion, before his burial. There are many traditions about what happened to the Three Wise Men afterwards. One story says they were baptised by Saint Thomas on his way to India. Another says their bodies were found by the Empress Helena, the mother of the Emperor Constantine, and brought to the great church of Aghia Sophia in Constantinople. From there they were moved to Milan, and eventually enshrined in Cologne Cathedral. But whatever the traditions, whatever the myths, whatever the legends may say, the truth they are trying to get at is that Christmas and Epiphany find their full meaning and their fulfilment in Good Friday and Easter Day, in the Crucifixion and the Resurrection, when we see the Suffering and Risen Christ fully revealed to us as Prophet, Priest and King. And they challenge us to ask whether we are offering our best, or merely our second best to Christ – to Christ in the suffering world, to Christ in the Church, to Christ who is to come again. They lavish on thy cottage-floor. Who will not wake or fast with thee! The visit of the Magi inspired one of the great poems by TS Eliot, ‘The Journey of the Magi.’ This poem was written after Eliot’s conversion to Christianity and his confirmation in the Church of England in 1927, but was not published until 1930 in his Ariel Poems. In some ways, this poem recalls ‘Dover Beach’ by Matthew Arnold (1822-1888), but also shows some influences of the earlier ‘The Magi’ by WB Yeats. Eliot’s poem recalls the journey of Magi to Bethlehem from the point of view of one of the Wise Men. He chooses an elderly speaker who is world-weary, reflective and sad. This narrator is a witness to momentous historical change who seeks to rise above that historical moment, a man who, despite material wealth and prestige, has lost his spiritual bearings. The speaker is agitated, his revelations are accidental and born out of his emotional distress, and he speaks to us, the readers, directly. The poem picks up Eliot’s persistent theme of alienation and a feeling of powerlessness in a world that has changed. The birth of Christ was the death of the old religions. Now in his old age, he realises that with this birth his world had died, and he has little left to do but to wait for his own death. On their journey, the Magi see ‘three trees against a low sky’ – a vision of the future Crucifixion on Calvary. The Incarnation points to the Cross. Without Good Friday and Easter Day, Christmas has no significance for us at all. The birth of Christ leads to the death of old superstitions and old orders. The ‘running stream’ may refer to the Baptism of Christ by John the Baptist in the River Jordan, which is also an Epiphany moment. The ‘six hands at an open door dicing for pieces of silver’ recall both the betrayal of Christ by Judas for 30 pieces of silver, and the dice thrown for Christ’s garment at the foot of the cross. The empty wineskins recall the miracle at the Wedding in Cana, another Epiphany theme. The early morning descent into a ‘temperate valley’ evokes three significant Christian events: the nativity and the dawning of a new era; the empty tomb of Easter; and the Second Coming and the return of Christ from the East, dispelling darkness as the Sun of Righteousness. In his old age, as he recalls these events, has the now-elderly Wise Man little left to do apart from waiting for his own death? He is a witness of historical change, but does he manage to rise above his historical moment? With his material wealth and prestige, has he lost his spiritual bearings? Or has he had spiritual insights before his time? TS Eliot was the greatest Anglican poet of the 20th century. In this poem, he links Christmas, Epiphany and the Easter story, links beginnings and ends, ends and beginnings, and so makes sense and meaning of the Christmas story at the beginning of this New Year. ‘We three kings of Orient,’ sometimes known as ‘The Quest of the Magi,’ is Hymn No 201 in the Irish Church Hymnal (5th edition), but it is not included in the New English Hymnal. This carol ranks alongside ‘O little town of Bethlehem’ by Bishop Phillips Brooks (ICH 174, NEH 32), among the best-known and popular American carols. But few people in Ireland realise that the author’s father was Irish-born and one of the bishops who played a pivotal role in the formation of the Anglican Communion. ‘We three kings of Orient are’ was written in 1859 by the Revd John Henry Hopkins (1820-1891). He was the Rector of Christ Church in Williamsport, Pennsylvania, when he wrote this carol for a Christmas pageant in the General Theological Seminary, New York, although it did not appear in print for another six years. The Revd John Henry Hopkins, jr, was born in Pittsburgh, Pennsylvania, on 28 October 1820, the son of John Henry Hopkins (1792-1868), an Irish-born Episcopal bishop who was the first Bishop of Vermont and later the eighth Presiding Bishop of the Episcopal Church. Bishop John Henry Hopkins was born in Dublin on 22 or 30 January 1792, the son of Thomas Hopkins and his wife Elizabeth nee Fitzakerly. The Hopkins family emigrated from Dublin in 1800 to Philadelphia. There he began his education at home with his mother, and he was reading Shakespeare before the age of nine. Elizabeth Hopkins established a school for girls in Trenton, New Jersey, and eventually sent her son to a Baptist boy’s school in Bordentown, and then to Princeton University. Because of his family’s straitened circumstances, Hopkins took a job at a counting-house, although his mother always wanted him to become a lawyer. At that time Hopkins was not particularly religious and his parents’ marriage was troubled. When his mother moved to Frederick, Maryland, to establish another school, he remained in Philadelphia with his father and friends. Hopkins decided to become an ironmaster and worked for an ironmasters in New Jersey and in Philadelphia before moving west to manage the ironworks at Bassenheim in Butler County. James O’Hara, an Irish immigrant who became the wealthiest man in Pittsburgh and Quartermaster-General, employed Hopkins to run the ironworks in the Ligonier Valley. There Hopkins got to know the Muller family, descended from a long line of German Lutheran ministers, and, after a religious awakening, began studying the Bible and other books, including works by Quakers and Swedenborgians. He travelled back to Harmony, Pennsylvania, to marry Caspar Muller’s daughter Melusina and they settled at Hermitage Furnace. However, the iron business failed, and Hopkins returned to Pittsburgh where he taught drawing and painting while studying law with a local lawyer. He was called to the bar in April 1819 and set up a legal practice in Pittsburgh. John and Melusina attended the Presbyterian Church, but he was also the organist and choirmaster at Trinity Church, the local Episcopal Church. When the Rector of Trinity Church moved to New Jersey and the next priest proved inadequate, Hopkins applied to be accepted for the priesthood, planning to merge his ministerial and legal vocations after ordination. In 1823, he was licensed as a lay reader by William White, Bishop of Pennsylvania, was ordained deacon on 14 December that year, and was ordained priest on 12 May 1824. He was placed in charge of Trinity Church, Pittsburgh, and from 1824 to1830, he was Professor of Rhetoric and Belles-Lettres in the Western University of Pennsylvania (now the University of Pittsburgh). He read the works of the Church Fathers in the original Greek and Latin, and although in principle committed to high churchman liturgical practices he opposed the introduction of the Confessional to the Episcopal Church. In 1827, he stepped back from the opportunity to become a coadjutor bishop to Bishop White, who was also the Presiding Bishop of the Episcopal Church. He realised his own vote would have decided the election in his favour, and lost by one vote. Later he would tell his son that had he voted for himself he would have wondered for the rest of his life whether his will or God’s had been done. In 1831, he accepted the charge of Trinity Church, Boston, where his great vision was to establish a diocesan seminary, although support for this plan never fully materialised. In 1832, Hopkins was elected the first Bishop of Vermont, and was consecrated in Saint Paul’s Church, New York, on 31 October 1832. At the same time he became the Rector of Saint Paul’s, Burlington. While he was Bishop of Vermont, the Diocese faced financial depressions, mass migration from Vermont to the west which was opening up, personal bankruptcy, and controversies. He took a great interest in education and made economic sacrifices for its promotion. After 1856, he devoted his whole time to the care of the diocese. Hopkins is credited with introducing Gothic architecture to the Episcopal Church, and was the architect of Trinity Church, Rutland, where he was the Rector from 1860 to 1861. In 1861, he published a pamphlet, A Scriptural, Ecclesiastical, and Historical View of Slavery, seen as an attempt to justify slavery based on the New Testament, and giving a clear insight into the Episcopal Church’s involvement in slavery. He argued that slavery was not a sin per se but an institution that was objectionable and should be abrogated by agreement. His lifelong dream of a diocesan seminary was realised in 1860 with the opening of the Vermont Episcopal Institute at Rock Point on Lake Champlain, outside Burlington. He also served for a time as the Chancellor of the University of Vermont. In January 1865, he was elected the Presiding Bishop of the Episcopal Church. That October, he presided at the general convention in Philadelphia. Largely through his friendship with Bishop Stephen Elliott of Georgia, the Presiding Bishop of the breakaway Protestant Episcopal Church in the Confederate States of America, the Northern and Southern branches of the Episcopal Church were reunited in 1866 after the end of the American Civil War. Subsequently, he presided in Christ Church, New Orleans at the consecration of Joseph Wilmer as Bishop of Louisiana, and in Louisville at the consecration of George David Cummins as Assistant Bishop of Kentucky. His took a leading role in the first Lambeth Conference in 1867, bringing together all bishops in the Anglican Communion, and had suggested a similar assembly 18 years earlier in 1849. He survived only two months after his return to Burlington in November 1867, and died of congestion of the lungs on 9 January 1868, at the age of 75. His funeral took place in Saint Paul’s Church, Burlington, and was buried in the cemetery at Rock Point. His monument was planned by his eldest son, the Revd John Henry Hopkins, the author of today’s carol. John and Melusina Hopkins had 13 children. In 1866, most of their large family gathered at the family home at Rock Point to celebrate their Golden Wedding anniversary, and their daughter-in-law, Alice Leavenworth Hopkins, published a book to commemorate the event. The University of Vermont and Harvard University hold many of the family papers. Most of his architectural legacy has been lost, including his Gothic Saint Paul’s Cathedral, Burlington, which was destroyed by fire in 1972. However, Saint Paul’s Lutheran Church, in Zelienople, Pennsylvania, which was built in 1826, still survives. The bishop’s son, the Revd John Henry Hopkins, jr, the author of this morning’s carol, was born on 28 October 1820, in Pittsburgh. He graduated from the University of Vermont with an AB in 1839, and received his master’s degree in 1845. For a while, he worked as a journalist before entering the General Theological Seminary, New York. After ordination, he was the seminary’s first music teacher (1855-1857), composed several hymns, and edited the Church Journal. Hopkins wrote words and music for ‘We three kings of orient are’ as part of a Christmas pageant in 1859 when he was visiting his father’s home in Vermont, although it did not appear in print until his Carols, Hymns and Songs was published in New York in 1863. While he was the rector of Christ Church in Williamsport, Pennsylvania (1876-1887), he delivered the eulogy at the funeral of President Ulysses S Grant in 1885. He died in Hudson, New York, on 14 August 1891 and is buried beside his father at Bishop’s House, Rock Point, Burlington, Vermont. I first learned this hymn when I went carol singing with schoolfriends from Gormanston and Muckross as a teenager in Christmas 1968 and sang the part of the Third King who brings the gift of myrrh. This hymn is based on the story of the Visit of the Magi in Matthew 2: 1-12, which the Epiphany Gospel reading next Sunday. Hopkins organised the carol so that three male voices would each sing a single verse by himself, in order to correspond with the three kings. The first and last stanzas of the carol are sung together by all three as ‘verses of praise,’ while the intermediate stanzas are sung individually, with each king describing the gift he is bringing and revealing the sacramental nature of the gifts offered to the Christ Child. The refrain praises the beauty of the Star of Bethlehem. This is the first Christmas carol from the US to win widespread popularity, and it was included in Bramley and Stainer’s Christmas Carols Old and New (London, 1871). In 1916, it was published in the hymnal for the Episcopal Church, which for the first time included a separate section for Christmas songs. King, and God, and Sacrifice! 7 Then Herod secretly called for the wise men and learned from them the exact time when the star had appeared. 8 Then he sent them to Bethlehem, saying, ‘Go and search diligently for the child; and when you have found him, bring me word so that I may also go and pay him homage.’ 9 When they had heard the king, they set out; and there, ahead of them, went the star that they had seen at its rising, until it stopped over the place where the child was. 10 When they saw that the star had stopped, they were overwhelmed with joy. 11 On entering the house, they saw the child with Mary his mother; and they knelt down and paid him homage. Then, opening their treasure-chests, they offered him gifts of gold, frankincense, and myrrh. 12 And having been warned in a dream not to return to Herod, they left for their own country by another road. and make his face to shine on us. your saving power to all nations. and reveal your justice in the sight of the nations. Our Saviour Christ is the Prince of Peace. 166, Joy to the world, the Lord is come! We introduced the Epiphany tradition of ‘Chalking the Doors’ at Saint Mary’s Rectory in Askeaton, Co Limerick, at Epiphany 2018. 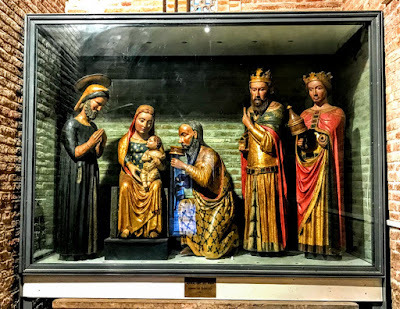 I was first introduced to this Epiphany tradition when I was visiting Westcott House, the Anglican theological college in Cambridge some years ago. 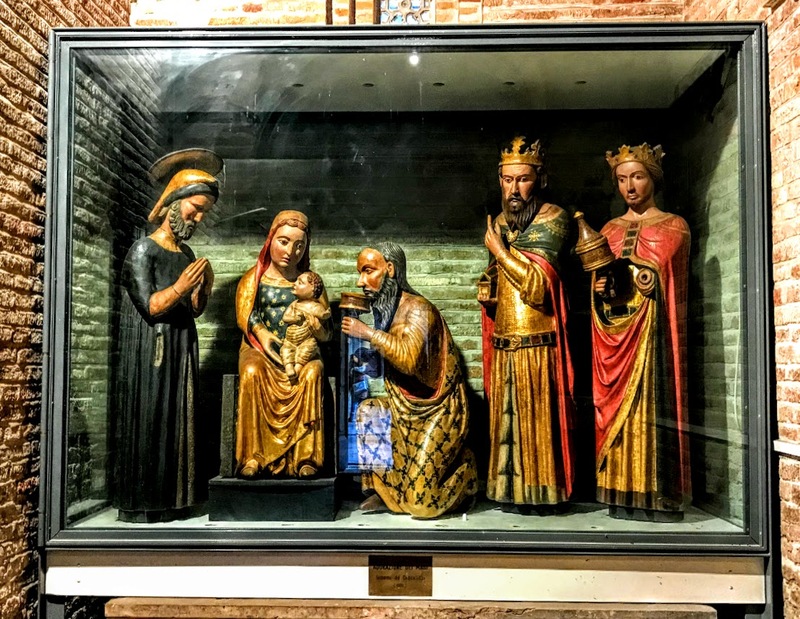 The formula for this traditional rite – adapted for Epiphany 2019 – is simple. Take chalk and write these letters and figures above the doors into the Church or the house: 20 + C + M + B + 19. The letters have two meanings. 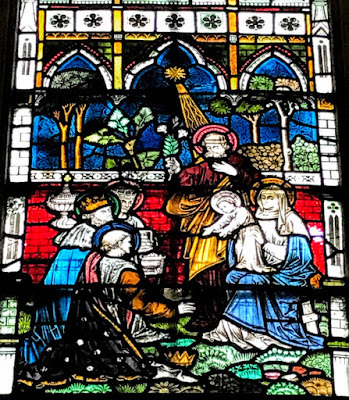 Firstly, they represent the initials of the Three Wise Men or Magi – Caspar, Melchior, and Balthazar – who came to visit the Christ Child in his first home. The ‘+’ figures signify the cross, and the figures ‘20’ at the beginning and ‘19’ at the end mark the year. Taken together, this inscription is a request for Christ to bless the building that has been marked, church or home, and that he may stay with those who worship or live there throughout the entire year. The chalking of the doors is a centuries-old practice throughout the world, though it appears to be somewhat less well-known in Ireland. But it is an easy tradition to adopt, and a good symbol of dedicating the New Year to God from the beginning, asking his blessing on our homes and on all who live, work, or visit here. The timing for chalking the doors varies from place to place. In some places, it happens on New Year’s Day. More commonly, though, it takes place on the Feast of the Epiphany, 6 January, the Twelfth Day of Christmas. In many places, the chalking takes place after the Epiphany Eucharist or Liturgy, and it can be carried out at any church, home or dwelling. Traditionally, the blessing is done by either a priest or the father of the family. This blessing can involve simply writing the inscription and offering a short prayer, or more elaborately, including songs, prayers, processions, the burning of incense, and the sprinkling of holy water. After many Epiphany Masses, satchels of blessed chalk, incense, and containers of Epiphany water, blessed with special blessings for Epiphany, are distributed. These are then brought home and used to perform the ritual. Another common practice is to save a few grains of the Epiphany incense until Easter, so that it can be burned along with the Easter candle. Leader (Priest or senior member of the family): Peace be to this house. Bless, + O Lord God almighty, this home, that in it there may be health, purity, the strength of victory, humility, goodness and mercy, the fulfilment of your holy law, the thanksgiving to God, + Father, Son and Holy Spirit. And may this blessing remain upon this home and upon all who dwell herein. Through Christ our Lord. After the prayers of the blessing, the initials of the Magi are inscribed upon the doors with the blessed chalk: 20 + C + M + B + 19. May all who come to our home this year rejoice to find Christ living among us; and may we seek and serve, in everyone we meet, that same Jesus who is your incarnate Word, now and forever. Amen. God of heaven and earth, you revealed your only-begotten One to every nation by the guidance of a star. Bless this house and all who inhabit it. Fill us with the light of Christ, that our concern for others may reflect your love. We ask this through Christ our Saviour. Amen. Loving God, bless this household. May we be blessed with health, goodness of heart, gentleness, and abiding in your will. We ask this through Christ our Saviour. Amen. All: The maker of heaven and earth. All: From this time forth for evermore. Loving God, bless this chalk which you have created, that it may be helpful to your people; and grant that through the invocation of your most Holy Name that we who use it in faith to write upon the door of our home the names of your holy ones Caspar, Melchior, and Balthazar, may receive health of body and protection of soul for all who dwell in or visit our home; through Jesus Christ our Lord. Amen. The three Wise Men, Caspar, Melchior, and Balthazar followed the star of God’s Son who became human two thousand and nineteen years ago. May Christ bless our home and remain with us throughout the new year. Amen. Visit, O blessed Lord, this home with the gladness of your presence. Bless all who live or visit here with the gift of your love; and grant that we may manifest your love to each other and to all whose lives we touch. May we grow in grace and in the knowledge and love of you; guide, comfort, and strengthen us in peace, O Jesus Christ, now and forever. Amen. Traditions like the Epiphany chalking of the doors serve as outward signs of our dedication to Christ, marked by daily prayer, reading, work and in our daily lives. Seeing the symbols over the doors can be a reminder, going in and going out on our daily routines, that our homes and all those who dwell there belong to Christ. In time, the chalk will fade. As it does, we can think of the meaning of the symbols written sinking into the depths of our hearts and being manifest in our words and actions. May Christ bless the house.